In the state of Illinois, schools are required to provide social emotional learning curriculums, tied to the common core standards. Prior to children entering school, they have the opportunity to develop these skills, free of charge, through play. Smilansky and Shefatya (1990) have cited that a child’s ability to positively engage with peers and adults is vital to school success, and play is the vehicle to social/emotional development. During play, children use verbal and nonverbal communication by negotiating roles, joining ongoing play, and appreciating the feelings of others. They are forced to take turns, wait patiently, and share. These opportunities also expose children to potential conflict situations, in which they have to balance personal needs with the desires and wants of others’. Pretend is an integral component of play vital to social/emotional development, allowing children to express anger, sadness, and worry in a controlled environment. In addition, it creates a venue for children to challenge rules and conventions, by rehearsing expected and unexpected behaviors in a safe, predictable manner (http://www.education.com). There is growing concern that children are acquiring academics at a rate faster than years past; however, their development of problem-solving skills lags in comparison. Play is the mechanism for which children learn problem-solving skills. Convergent problem solving can be defined as the ability to bring a variety of isolated pieces of information together in order to identify a single solution. While convergent problem solving is correlated with performance on standardized measures of intelligence, perhaps more valuable is divergent problem solving, which is linked to creativity. This can be defined as the ability to begin at one starting point, and devise multiple solutions. Examples include things such as identifying all the uses for a paperclip, rubber band, or hanger. This type of problem solving can be fostered through object play. Examples of relevant play materials would include items such as blocks, Legos, and play dough, which can be used in a variety of ways. Open-ended toys allow children to develop flexibility in their thinking because there are multiple ways to use them. Pretend play, which is perhaps the best predictor of divergent problem solving, allows children to make believe and engage in fantasy. It was noted that children who demonstrate higher levels of pretend play evidence the most developed problem-solving skills. Researchers cite the link between divergent problem solving and pretend play may rest in the concept of decentration. Decentration can be defined as “the ability to attend simultaneously to many features of one’s environment, to transform objects and situations while at the same time understanding their original identities and states, to imagine at one and the same time things as they are and also as they were.” In reality, this means that a cardboard box being used as a car, in a child’s mind, is still recognized as a cardboard box (http://www.education.com/reference/article/play-creativity-problemsolving/). Another example might be a child using a stick as a magic wand, but yet he recognizes that it is simply a stick. 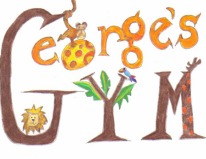 George’s Gym prides itself on using pretend play as the foundation for learning. The majority of our games and activities are done simply using our imagination. Together, we build a fantasy world in which we teach skills tied to social, emotional, and cognitive development. Because children control many aspects of our imaginative play, creativity, independence, and problem solving skills are continuously fostered.